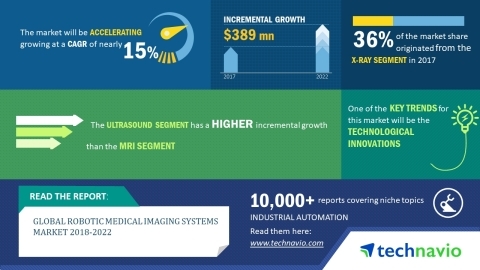 The global robotic medical imaging systems market 2018-2022 is expected to register a CAGR of around 15% during the forecast period, according to the latest market research report by Technavio. A key factor driving the market’s growth is the increasing prevalence of chronic diseases. Physicians and hospitals that specialize in oncology treatments are expected to adopt robotic medical imaging systems for screening of cancers and tumors. These systems enable shorter treatment and greater patient throughput. This can assist in increasing the number of treatments on a daily basis and thereby generate greater revenue. This market research report on the global robotic medical imaging systems market 2018-2022 provides an analysis of the most important trends expected to impact the market outlook during the forecast period. Technavio predicts an emerging trend as a major factor that has the potential to significantly impact the market and contribute to its growth or decline. The rapid growth in non-invasive surgeries has led to the introduction of new imaging systems with innovative platforms and improved durability. This will help in enhancing the accuracy of non-invasive surgical procedures during the forecast period. Vendors are offering high-definition systems that deliver high-resolution images. “Some of the latest technologies offered by HD systems include confocal micro-endoscopy, narrowband imaging, and fiber optics. Vendors are introducing systems that ensure examining and viewing the tumor in the exact size, shape, and location for effective treatment, as precision and accuracy are the major issues affecting treatment,” says a senior market research analyst at Technavio. This market research report segments the global robotic medical imaging systems market into the following products (X-ray, ultrasound, MRI, and CT scan) and key regions (the Americas, APAC, and EMEA). The X-ray segment held the largest market share in 2017, accounting for more than 36% of the market. This product segment is expected to dominate the global market throughout the forecast period. The Americas held the highest share of the global robotic medical imaging systems market in 2017, accounting for a market share of approximately 47%. The market share occupied by this region is anticipated to decrease by almost 2% during 2018-2022. However, this region will dominate the market throughout the forecast period.